"It took a village, but we made it happen. It is so satisfying." 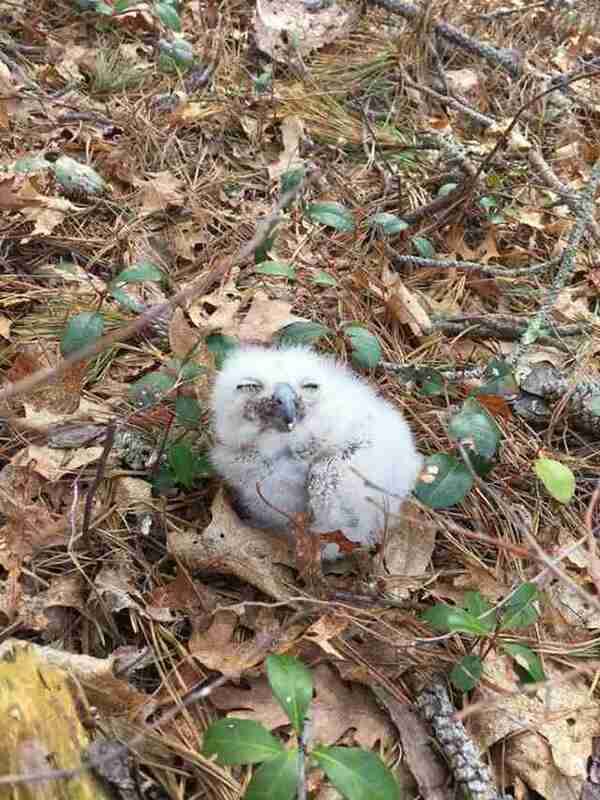 Last week, on a cool spring day in Massachusetts, something went terribly wrong for this baby bird. He'd somehow fallen out of his nest, and had no way of getting back on his own. He was utterly lost — that is, until a few kind people stepped in to set things right. Stephanie Ellis is executive director of Wild Care Cape Cod, a group dedicated to rescuing and rehabilitating injured animals. So, when she got a call from the homeowner who'd found the fluffy little bird, she dispatched one of the group's volunteers to assist. 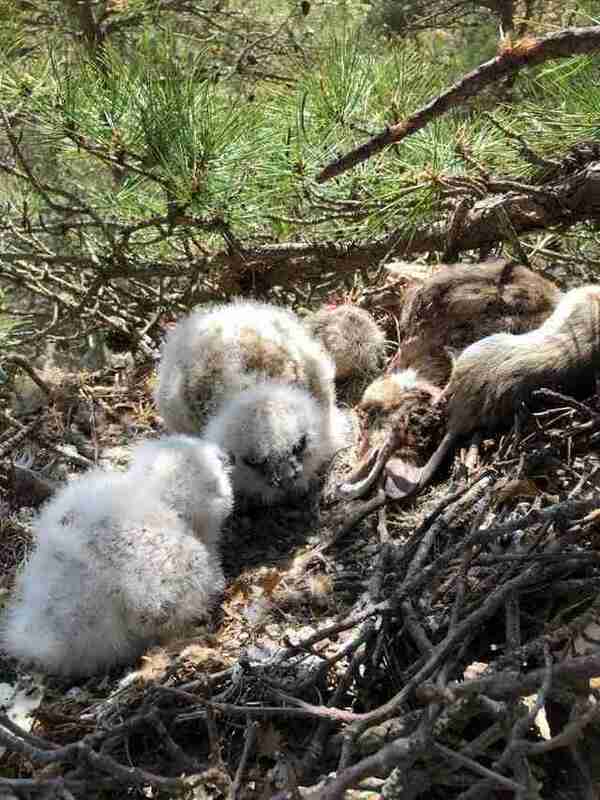 "It was a baby great horned owl, only about 10 days old," Ellis told The Dodo. "This owl was way too young to be on the ground, so we had our volunteer bring him in to do an assessment." 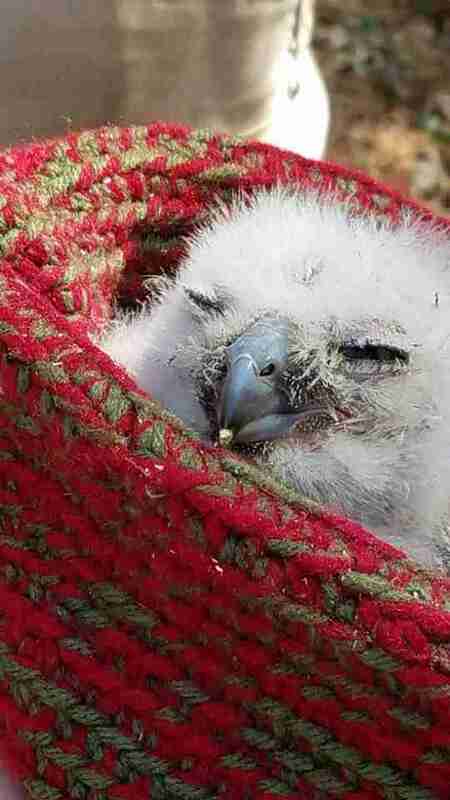 Fortunately, despite being stranded, the baby owl was found to still be in relatively good shape. "He was healthy, but a little dehydrated," Ellis said. "We out him into an incubator and provided hydration fluid." Ellis also sure the owl was properly fed — even though that meant being up late at night to keep pace with his naturally nocturnal feeding time. "I filled in for mom," she said. Ellis' number one priority, however, was to reunite the owl with his real parents as soon as possible. "Baby owls imprint on people very easily," she said. "So I went out with a rescue volunteer to the location where the bird was found." They went there looking for a nest the owl might have fallen from, and to see if there were any grown-up owls around who might be occupying it, missing their baby. 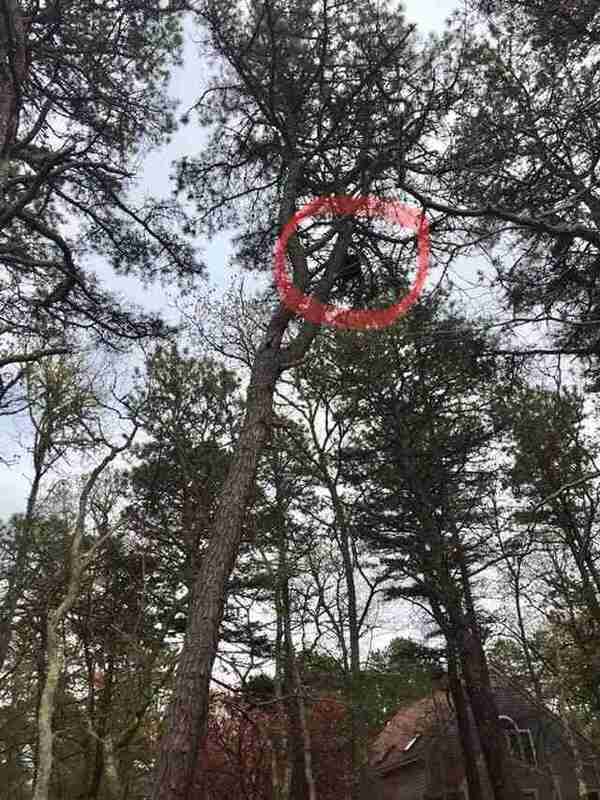 The homeowner pointed to a nest, 40 feet up in a tree above where the baby owl had been found, and reported having seen owls flying from it. "Being such a tiny baby, he couldn’t have gone far, so I felt pretty confident that this was the nest," Ellis said. 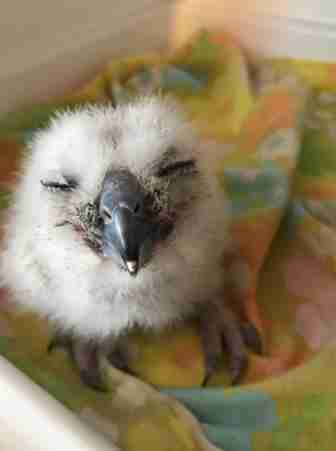 "Our mission was to get this baby back into the nest." But returning the baby to his nest was easier said than done. They'd need some special help. 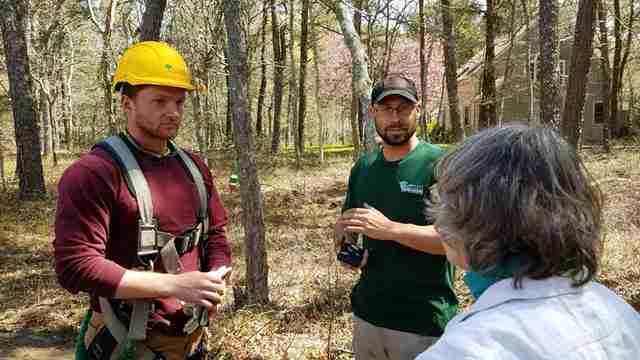 As it turns out, one of the volunteers at Wild Care has a son who works for Bartlett Tree Experts, a local landscaping and tree services company. The next morning, they stepped in to help. "They were just amazing. They had a truck nearby," Ellis said. "Within just a couple of hours, they were able to meet us." The baby owl was certainly ready for what was about to happen next. 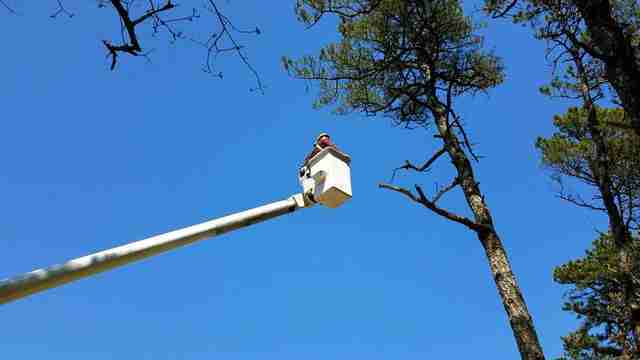 ... before venturing high up in a cherry picker to deliver him back where he belonged. "It was the most ideal situation. It was wonderful," Ellis said. 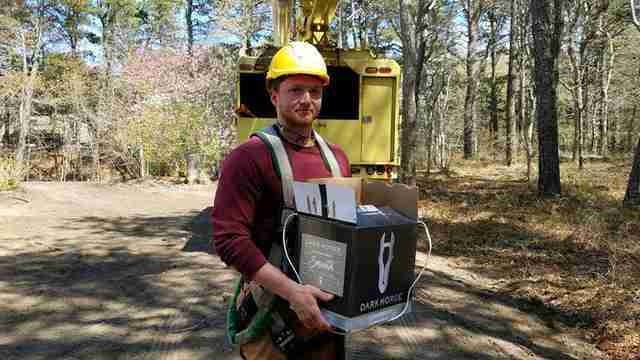 "As they were working, they saw an adult owl flying by. That was a good sign." Since no one had been able to peek into the nest beforehand, there was still some question whether this really was the right place. But upon closer examination came a very encouraging sign. "There was another baby in the nest!" Ellis said. 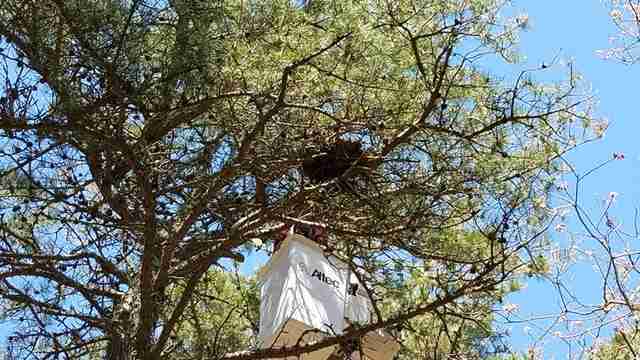 "I was so worried that they would get all the way up there and see it wasn’t the nest, or that there were dead chicks in the nest. Instead, there was a sibling surrounded by lots of food. Their dad must be a good provider." Then came the moment that everyone had been waiting for — the lost baby owl was finally home. 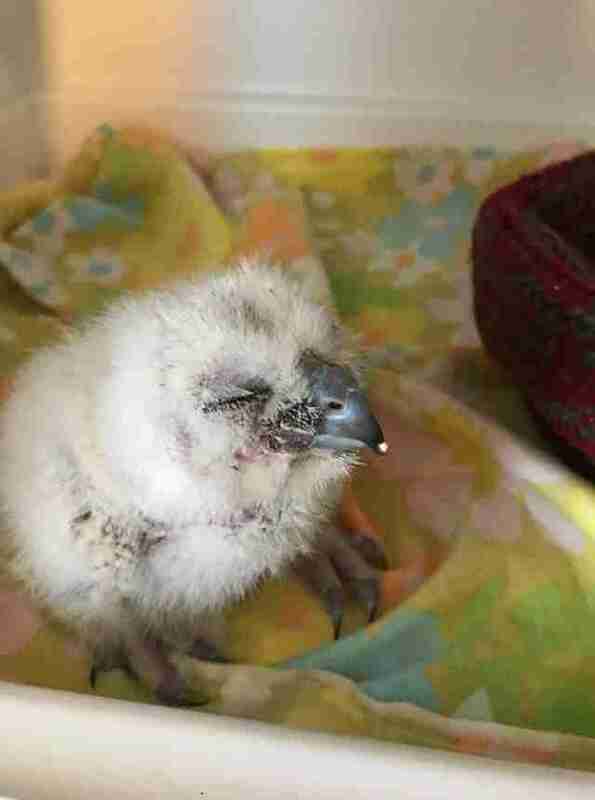 Ellis believes that the baby owl's odds at normal life have been restored. Volunteers have visited the spot daily since then, just in case he'd fallen again, but this time the owl has apparently decided, wisely, to stay put — an opportunity provided to him by the kindness of strangers. "It looks like everything is going well," Ellis said. "It took a village, but we made it happen (and in a short period of time). It is so satisfying." To learn about future rescue efforts, and to support its lifesaving work, visit Wild Care Cape Cod's website or follow it on Facebook.